Finally welcoming summer in the northern hemisphere, Mudlet 3.2.0 is here. Mudlet can display text in many other languages now, coroutines are available, and userwindows (stand-alone miniconsoles) have been massively improved! Veteran Mudlet developer SlySven worked to teach Mudlet to display text in Spanish, Russian, and many other Western languages! Go to Preferences > Encoding to select the encoding you’d like to use. This is the first baby step in enabling Mudlet to support internalisation. Choosing the encoding will help Mudlet display the letters right, but triggers will not work with non-English text and nor will some Lua string. * functions like string.len(). 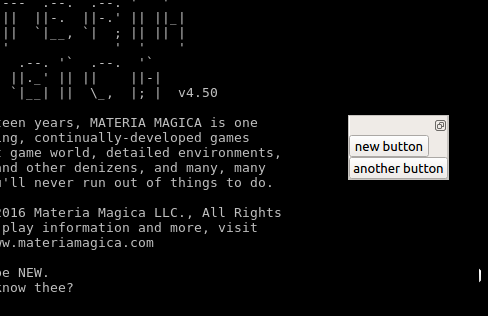 We’ll be adding these features incrementally and it will all be ready in Mudlet 4.0. Lua coroutines are now available in Mudlet, opening up a lot of possibilities for writing your scripts better – check out the demo in the manual. 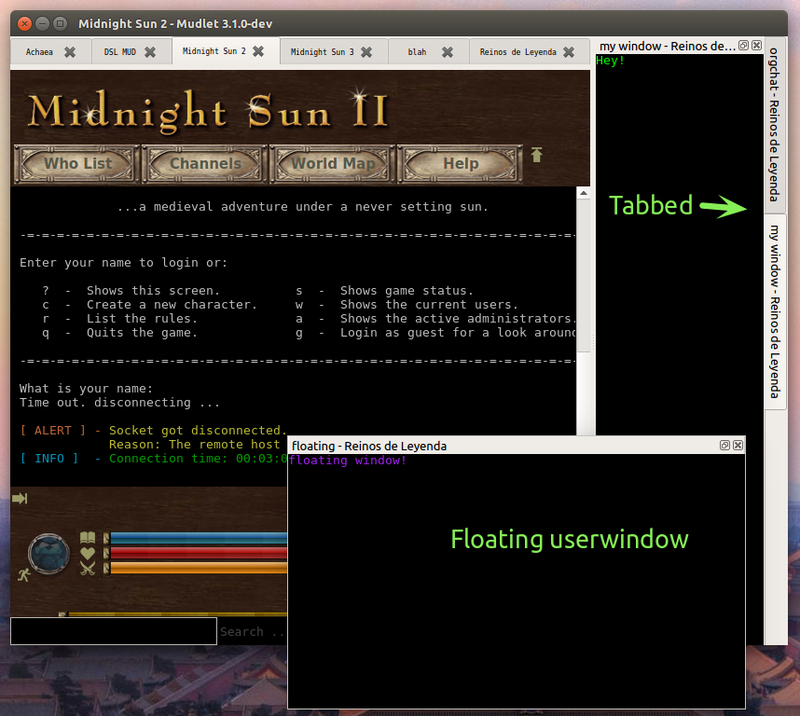 Big thanks to the core Mudlet developer ahmedcharles for enabling this! If you happened to insert an XML-invalid character such as 0x0 in your script, Mudlet wouldn’t be able to load it back in and lose everything that followed it. This has been fixed – credits go to to Buck in Discord for identifying the problem and SlySven for fixing the problem! 0x0 and it’s friends will now get saved and loaded just fine. We’ve also made it so the Connections window automatically opens up if you don’t have any profiles on autoload, and the last used profile is automatically selected. There’s too much blank space in though, isn’t there? 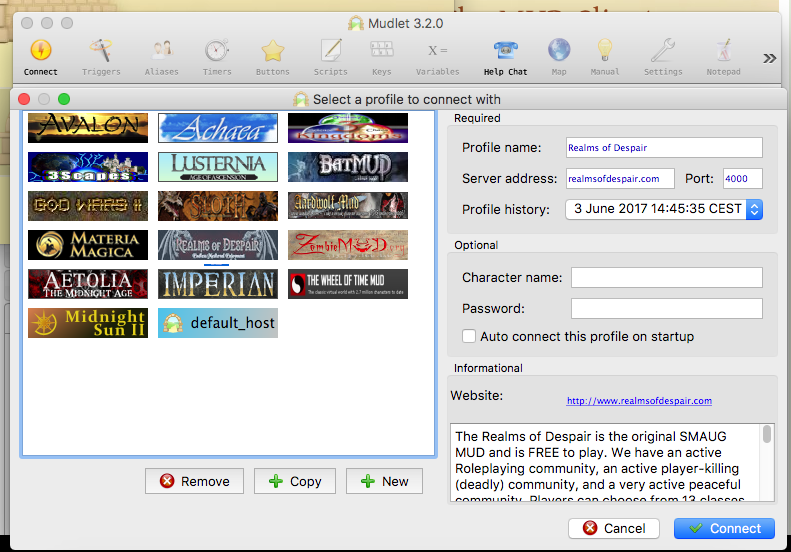 MUDs that get onto Mudlet’s default profiles list are ones that make a significant contribution to the open-source Mudlet project, or those that go the extra mile to add a great gaming experience for their players on Mudlet: mapper support and a UI package. Thanks to the modest itsTheFae for his work in making this happen. Floating toolbars – those that you can make in the Buttons view and stick buttons in – no longer spazz out when you click on the script editor. This release was brought to you by Ahmed Charles, Florian Scheel, itsTheFae, kbasten, Mike H, Stephen Lyons, and Vadim Peretokin. Depressed by cancelled projects at work? Interesting in contributing to a project and actually seeing your work get used by people? Hop on board! Random tip: you can use Unicode art in Mudlet! Try doing cecho(“°º¤ø,¸¸,ø¤º°`°º¤ø,¸,ø¤°º¤ø,¸¸,ø¤º°`°º¤ø,¸”) or cecho(“<green>(╯°□°）<dark_green>╯︵ ┻━┻”). You can find more examples over here.